Rear Window stars James Stewart as a wheelchair bound photographer, bored with his predicament he gazes out of his rear window and voyeuristically spies on his neighbours. Things get exciting when he becomes convinced he has witnessed a murder and sets about proving it. 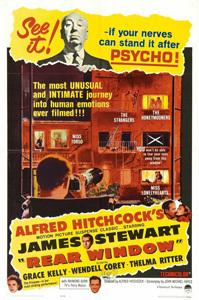 Hitchcock masterfully creates a feeling of danger and suspense and this is a tense film for the viewer as you are inevitably sucked into the action through skilful direction and fantastic acting. This is an extremely entertaining thriller with a touch of romance and it is far more suspenseful than your average horror.